Heavy Duty Vinyl Gates- Single Gates, Walk Gates and Double Drive Gates. 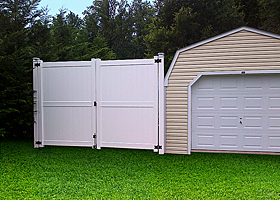 Matching gates are available for all of fence styles we offer. 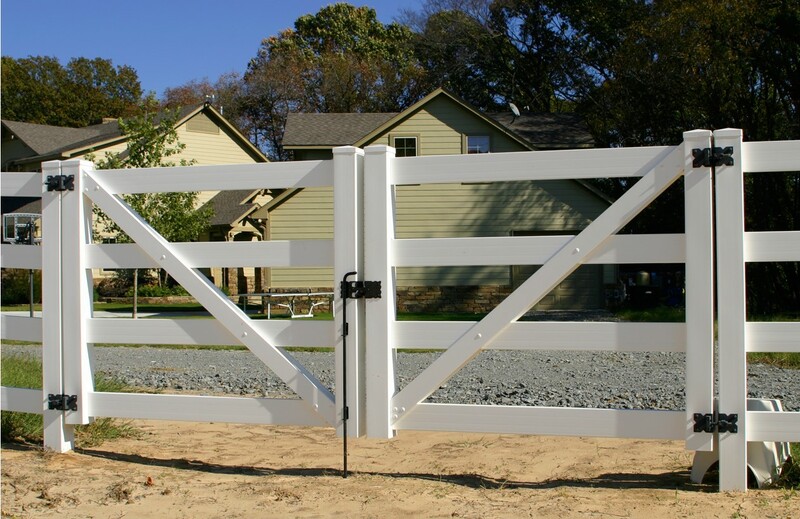 We have matching gates for every residential fence style, commercial fence styles online ,plus ranch and horse fence gates. Our vinyl gates are complete gates that include everything to build a gate that will last a lifetime! All of our gates are swing gates, but if you need a custom gate we can make it! We do not carry automatic gates, however our vinyl can be easily adapted to most automatic systems. Our heavy duty vinyl gates include the best gate hardware available. The hardware is stainless steel powder coated black and comes with a lifetime warranty. No more rusting! As an upgrade we also carry black polyvinyl hinges that are “multi-adjustable” for vertical and horizontal adjustment plus tension adjustment for self-closing. Our latches are standard stainless latches to match our stainless hinges. If you have a pool, ask for our upgraded latches that are key lockable and BOCA approved! If your pool requires a Magna Latch or lock, we have that available as well. Click here to view our Gate Hardware The double drive gates also include a key lockable drop rod. If you want your own custom gate size you can reduce the size on site! We also have an available aluminum post insert for the hinge post for your gate. This aluminum insert is specifically designed and engineered to allow our vinyl post to support the gate without any sagging. This replaces supporting the hinge post the old way of filling it with concrete and rebar. Let us know if you would like this included in your quote! Call today for any questions or if we can provide a quote for your project! Drop Pin Kit per double gate. Heavy Duty Vinyl Walk Gates Plus Double Drive Gates that you can afford – Contact us 24/7 for a Free Quote!